IPL 2019: Delhi Capitals would be hoping for a change of fortunes in the upcoming IPL season. IPL 2019: Part of the Delhi Capitals franchise, Ricky Ponting and Sourav Ganguly was seen discussing team strategies during a practice session at Feroz Shah Kotla. Among the best ever cricket captains, both the Australian and the Indian are well respected in the cricket fraternity. With both the cricketers bringing their experience to the fore for the Capitals, it sure seems this could be a successful season for the team that has many promising cricketers. Recently, Delhi Capitals posted a video where both the former legends are seen in a candid moment. 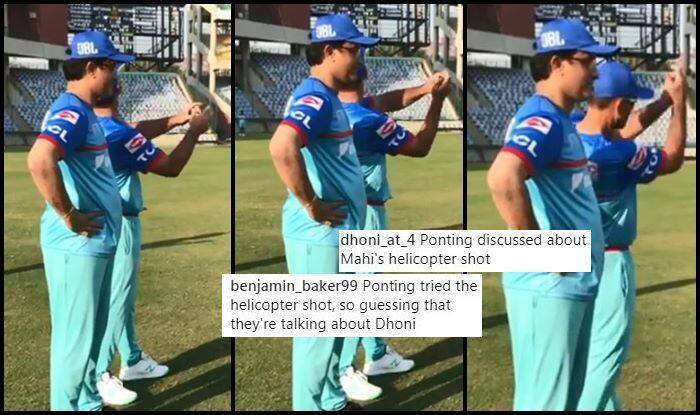 Ponting is looking to explain something to Ganguly as he plays a shot which is quite identical to MS Dhoni’s ‘helicopter’ shot. The Instagram page asked fans to reckon what they feel is being discussed. Most of the fans felt that they were discussing Dhoni’s helicopter shot. Here are the screenshots of fan reactions. Delhi Capitals will play their tournament opener on Day 2 against a formidable Mumbai Indians.